Autoview is a Chrome extension that listens to your Tradingview alerts and places orders on the exchange of your choosing. You control what Autoview does by inserting a specialized syntax into your Tradingview alert message box. 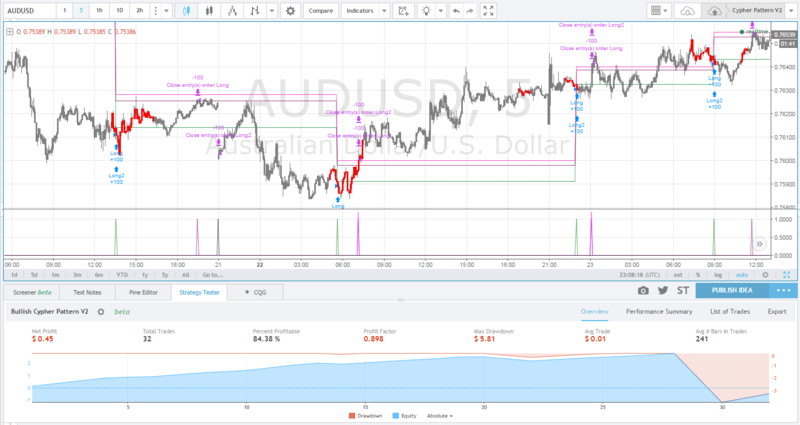 Whether you simply want to add a stop loss or trailing stop on an exchange that does not provide it, or automate an existing Tradingview strategy, Autoview can help you do that. 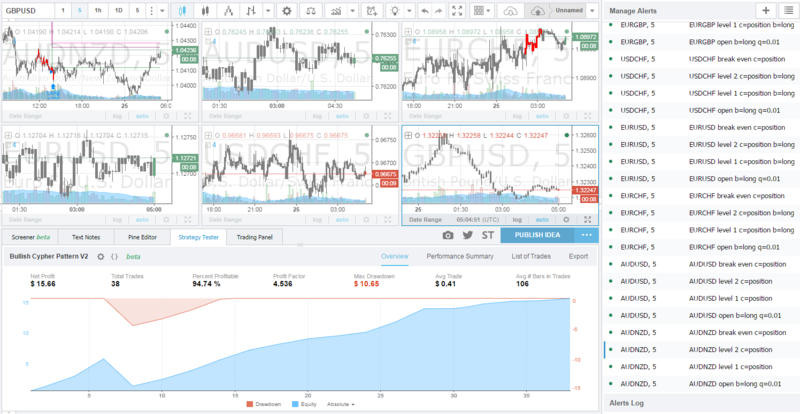 We provide the ability to use your Tradingview alerts to place live trades on your behalf. 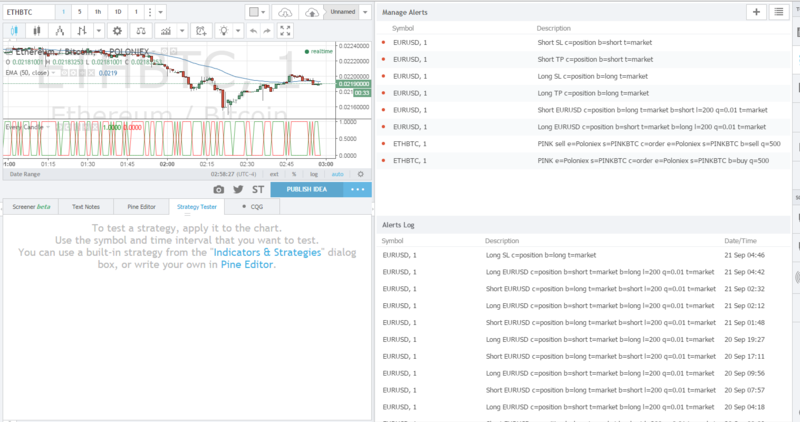 Using Tradingview's custom Pine Script language you can create anything from fully automated strategies and indicators to unique trailing stops or take profits. Combined with the Autoview syntax, there is almost no limits to what you can create. Should you ever have any questions, concerns or issues, there is almost always someone willing and able to help. We are 2 friends building tools, so thanks to this great community we can focus our time on maintaining and improving Autoview. Get everything that Autoview has to offer for one monthly fee, or use it for free on select exchanges. Bitmex Testnet - Test trading Bitcoin and other cryptocurrencies with up to 100x leverage. Delta Testnet - Delta is the most reliable place to trade Futures on Bitcoin, Ether, Ripple and other altcoins. Deribit Testnet - The most advanced derivatives trading platform on for Bitcoin available today. Gemini Sandbox - The next generation digital asset platform built for businesses and investors. OANDA Practice - Leader in currency data, offering forex & CFD trading, corporate fx payments and exchange rates services for a wide range of organizations and investors. Bitmex - Trade Bitcoin and other cryptocurrencies with up to 100x leverage. Bittrex - Bittrex is a US based crypto-currency exchange designed with security and scalability in mind. Delta Exchange - Delta is the most reliable place to trade Futures on Bitcoin, Ether, Ripple and other altcoins. Deribit - The most advanced derivatives trading platform on for Bitcoin available today. GDAX - US based digital asset exchange with trading FIX API and REST API. Gemini - The next generation digital asset platform built for businesses and investors. Kraken - Leveraged trading on US based Bitcoin and Ethereum exchange. OANDA - Leader in currency data, offering forex & CFD trading, corporate fx payments and exchange rates services for a wide range of organizations and investors. Poloniex - A US exchange trading in numerous virtual currencies. Carbon Copy - Send a copy of a command to any public endpoint. 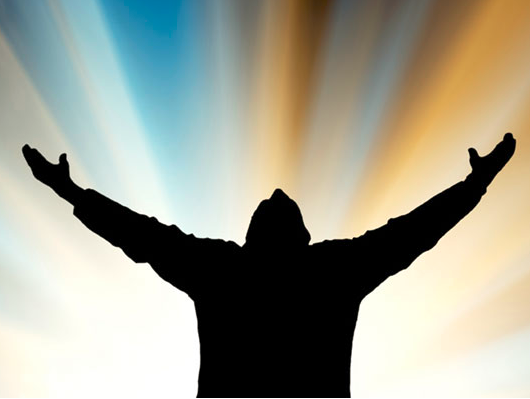 A Good strategy is finding that perfect balance between the way you feel and how it performs. In the forex trading bot example below, we're showing a fully automated strategy setup that runs on 6 different forex markets. This is not a public strategy, only an example of a system you can build yourself. "Amazing possibilities!!! Thanks SO MUCH for this one-of-a-kind tool! I will be donating." Test intensive, make sure you understand the commands syntax before you put money on the line. To connect TradingView and Autoview, you will need to place at least one command (examples below) in the Message section of an Alert. a * Anything (excluding special characters) The alias for the API credentials you want to use for this command. bcc 0 0, 1 Relay this command to the configured endpoint only. Exchange requests will not be made. b all buy, long; sell, short The side of the market you would like to play. c n/a order, position Used to cancel open orders or close open positions. Random: #-#, %-% Cancels orders or closes positions (see cmo for ordering). cmo oldest newest, oldest; lowest, highest; smallest, biggest; random How the orders are sorted for canceling. How the positions are sorted for closing. cc 0 0, 1 Relay this command to the configured endpoint and exchange. delay n/a > 0 Delay allows for a pause (in seconds) between commands within the same alert (e.g. delay=10). d 0 0, 1 Prevents any live action from the command. This is helpful for debugging by outputting the live parameters. e Chart Symbol 1Broker, Binance, Kraken, ... The receiving exchange for your command. Random: #-# The literal price in which to place an order or close a position. Random: #-#, %-% Bitfinex: Whether the order is to be hidden (i.e. h=1). BitMEX: Sets the order to be hidden if 0. If > 0 this portion of the position to be visible (i.e. Iceberg). Deribit: Maximum quantity within an order to be shown to other customers, 0 for invisible order. l all >= 0 Leverage allows your available balance to be multiplied but increases risk. Random: #-#, %-% The amount to undercut or overcut the top order in the book. ps top last, top, position Bitfinex (last, top) Change the reference for Price (p) calculations. Deribit (position) When closing positions (c=position), use the position average in calculations. Random: #-#, %-% The portion of your balance or position you would like to effect. ro 0 0, 1 BitMEX Order can only reduce your position, not increase it. s Chart Symbol BTCUSD3M, LTCUSD, PINKBTC, ... The receiving exchange's market for your command. 1Broker, Binance, BitMEX: Provided value is applied to the position's entry price. Deribit: Triggers the order (buy or sell) when the index price hits the stop price. Kraken: Triggers the order (buy or sell) when the last traded price hits the stop price. close, open, settle Limit: Order will be placed in the books to await being filled. Market: Place order in the book for immediate filling (p is ignored). FOK: Fill Or Kill orders will either completely fill or be aborted. IOC: Immediate Or Cancel orders can be partially or completely filled, but any remaining portion is cancelled. Post: If any part of the order would have executed, it will be cancelled instead. Close / Open: Can be used together with c=order for specific order types. Random: #-#, %-% 1Broker, Binance, BitMEX: Provided value is applied to the position's entry price. Deribit: Triggers the order (buy or sell) when the index price hits the profit price. Kraken: Triggers the order (buy or sell) when the last price hits the profit price. Kraken: Triggers a market order (buy or sell) when the last traded price goes against the position by the stop offset amount. u contracts contracts, currency The quantity (q) unit being provided. w n/a Anything The currencies to transfer from wallet account to another (e.g. spot to margin). margin, spot Balance: Your available balance excluding open orders/positions. Equity: Your available balance including profit/loss. c=order t=open Cancel any open orders. c=position t=market Close any open positions with market orders. e=okcoin c=position q=25% t=market Close 1/4 of any open positions using market orders. e=poloniex s=pinkbtc b=sell q=1000 t=limit Place a sell for 1000 PINK over the lowest selling price. e=okcoin s=btcusd3m l=20 b=buy q=0.025-0.05 u=currency Market buy a random amount between 0.025 and 0.05 BTC. e=poloniex w=etc,eth y=margin q=10% Transfer available BTC from Margin to Spot wallet. Transfer available ETC, ETH from Spot to Margin wallet. This is a strategy that runs across 6 forex markets. It opens 2 orders per signal, has 2 take profit triggers closing 50% each with a Break Even Trailing Stop and a strategic Stop Loss.